From the files of The Gazette September 5, 1996. Thomas Martin Wood was born in Bourton-on-the-Water, Gloucestershire, England in 1807, the son of Henry and Ann Wood. Henry Wood was a Church of England clergyman -- possibly the Rev. Henry Wood who served in Ferryland in 1802-1803. It seems certain that Thomas received a good education: his father's occupation would have afforded him the opportunity; and he entered the work force as an office clerk, a position requiring an education. Evidence indicates that Wood emigrated to Newfoundland at an early age, possibly while still a teenager. He spent several years as a clerk with Holdsworth and Company at Ferryland, and later with Cousens at Brigus. While at Brigus, Wood met Archdeacon Edward Wix, who encouraged Wood's aspiration to enter the Church of England ministry; in 1831 Wix appointed Wood school teacher and catechist at Pouch Cove. The next year Bishop John Inglis of Nova Scotia, while on a visit to St. John's, ordained Wood as a deacon. He was assigned clerical responsibilities for St. John's Outharbours (Topsail and other communities near St. John's along the bottom of Conception Bay, and Petty Harbour). In 1836 Wood was transferred to Greenspond where he served until 1840. 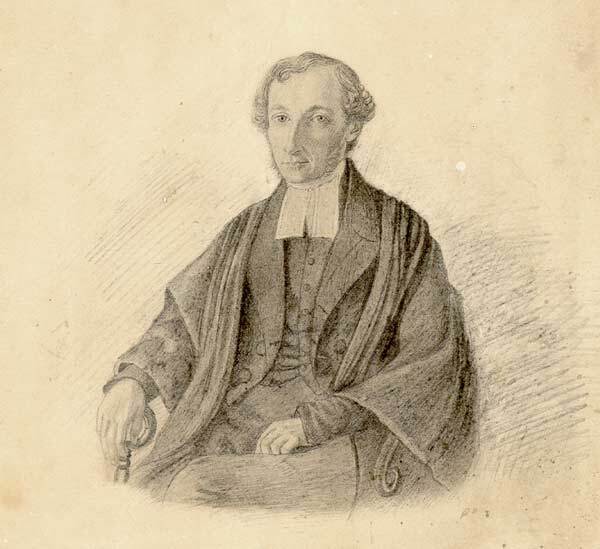 In 1839 Rev. Aubrey Spencer was appointed first bishop of the newly created Church of England diocese of Newfoundland. 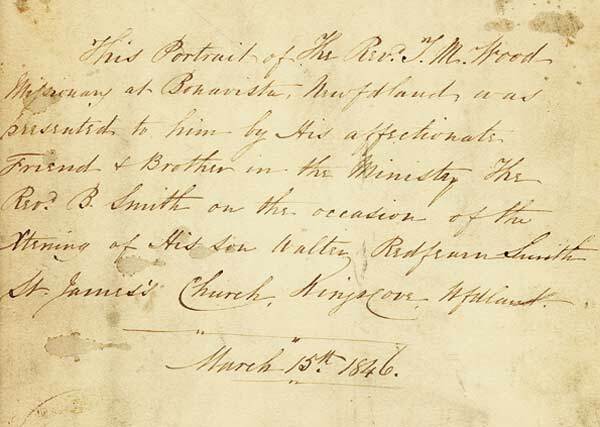 The following year, on June 28, Thomas Wood was the first person Spencer ordained as a priest, and was also the first Church of England priest to be ordained in Newfoundland. In 1841 Wood was transferred to Bonavista and later served in Trinity and as rural dean of Trinity Bay before succeeding Rev. Charles Blackman as incumbent at St. Thomas' Church in St. John's in 1853. In 1856 he was made rural dean of Avalon. Wood had been assigned to St. Thomas' by Bishop Edward Feild, who had become Bishop of Newfoundland in 1844. In 1857 Feild appointed Wood as bishop's commissary, making him administrator of the diocese in the absence of the bishop. He served in this office for 24 years and was in charge of the diocese between Bishop Kelly's resignation in July 1877 and Bishop Jones' installation in June 1878. It was Wood who conducted the installation of Llewellyn Jones as Bishop of Newfoundland. St. Thomas' was a part of the Anglican Cathedral parish until 1877 when it became a parish in its own right. This change resulted in Wood becoming the first rector of the new parish, a position he held until 1881. Wood married Mary Finch of Trinity in January 1833. They had at least five children, including a son Arthur, who succeeded his father as rector at St. Thomas', serving from 1881 to 1897. It is Arthur for whom Canon Wood Hall, next to St. Thomas' Church, is named. Thomas Wood died at St. John's on Aug. 16, 1881. Thomas Wood was the first priest ordained by Bishop Spencer in the Church of England diocese of Newfoundland. This sketch may have been commissioned by Reverend Benjamin Smith who served as a missionary in Newfoundland during the same time as Wood. Courtesy of Archives and Special Collections (MF - 331), Memorial University of Newfoundland, St. John's, NL. "This Portrait of The Rev. T. M. Wood / Missionary at Bonavista, Newfdland, was / presented to him by His affectionate / Friend & Brother in the Ministry The / Rev. B. Smith on the occasion of the / Xtening of His son Walter Redfearn Smith / St. James's Church, King's Cove, Newfdland. / March 15th, 1846." Rev. Benjamin Smith (1814-1893) was a contemporary of Wood's, serving as Church of England Missionary at Catalina and King's Cove while Wood was at Bonavista and Trinity. This would lead one to believe that it was commissioned by Smith as a gift for Wood in the 1840s; as both men were resident in Newfoundland in that decade, it is possible that the drawing was done in Newfoundland. The drawing shows Wood from the waist up, seated in a chair, and in clerical robes and collar. It had been framed, but only the backing was still intact when the archives acquired it. The framing was done by J. Short, Carver & Gilder, 85 High St., Poole, England. As there was much contact between Newfoundland and Poole, it is a quite likely place for the framing to have been done. There is no indication of the date of framing. For a pencil drawing that is 150 years old, it is in excellent condition.